Hal Andrews, reporter and creator of X Marks the Spot. (X Marks the Spot Meaning: Place were they were killed or where the dead body was found). This edition of X marks the spot is special in the fact that it is signed by none other than the original author of the magazine. He wisely went anonymous when the booklet first went into print back in 1930.The man's name was Harold "Hal" Andrews. Hal was a newspaper reporter. 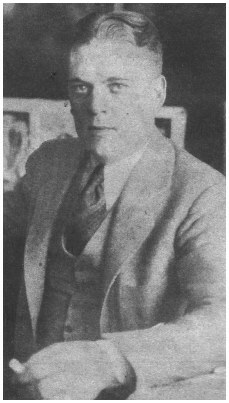 In early 1924, Hal was reporting in various crimes committed around Chicago for the United news association. Hal was working for different Chicago newspapers (City news Bureau and United press) before settling in with Herald Examiner. While there, Hal slowly got interested in the criminal aspect of his job and decided to do his part in helping the city clean up it's act. 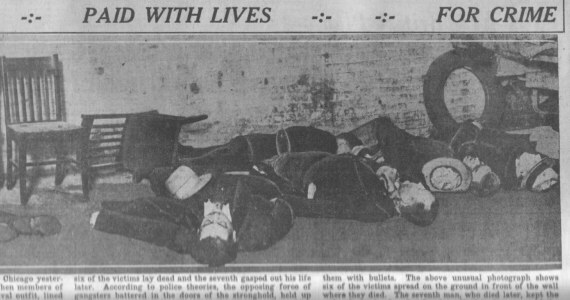 It all happened when dead gangster photos showed up on his editor's desk. Most of the reporters would take interest in viewing the gory unretouched photos. 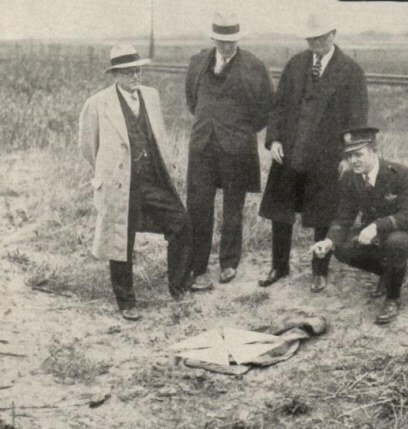 In those days, what was usually shown in the newspaper was the place where the body had been with a big X showing where the victim was found. Hal had asked his editor if he sometimes felt like publishing those unretouched gory photos before the body was removed for the public to see. Hal's editor replied "Yes, I would, but you know that I can't." Putting out a photo like that in a tabloid would cause immediate public indignation and bring on the wrath of the gangsters. Until then, all the public had seen were crime scenes with X's placed where the body had been. That was the case until the St. Valentine's Day Massacre of 1929 occurred. Anselmi, Scalise and Giunta death scene, The bodies were removed and an X placed where the one of the bodies was found. This was the permitted view in the papers at that time. The editor stated that they had to definitely print that one without X's and use the bodies. People would wonder what were seven X's meant, and that the photo would look like a damn railroad sign posting of some sort. 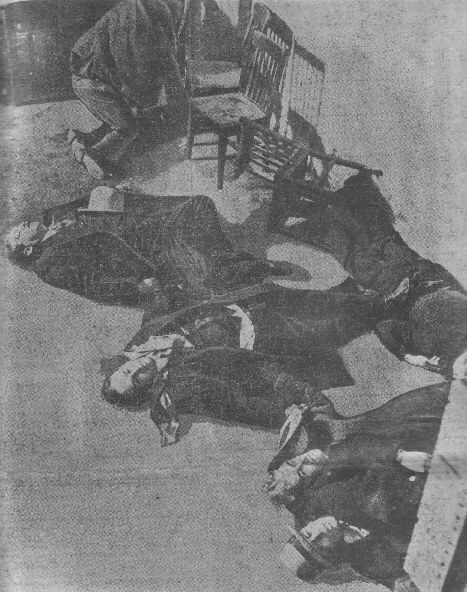 They decided that they would put in the bodies, but they would still have to modify the photo to appease the bible thumping crowd and moralists.The massacre photo had finally been published with the actual bodies of the gangsters, in some newspapers upside down and in all editions the blood was magically removed by the newspaper's photolithography dept. Cleaned up version (no blood) of Wisconsin Newspaper February 15,1929. Front page of Chicago Herald and Examiner February 15,1929. Hal saw an angle to start something new. Purchasing gory photos from the various newpapers he had access to, he published a booklet called X Marks the Spot. In it he describes the many Chicago gangsters and their misdeeds. Once when questioned how he got the photos, Hal later stated catergorically that all the photos in his X Marks the Spot were purchased by him, from the newspapers, and that he had the bill of sale for them in his safety deposit box. He later added a erratum to subsequent copies. It was a story about Harry Madigan, a friend who owned the saloon in front of which States Attourney William McSwiggin, and his gangster pals were cut down by a thompson machine gun supposedly wielded by Al Capone. In it, Andrews spills the beans on Madigan being forced to by booze from the Capone mob instead of the O'Donnells. 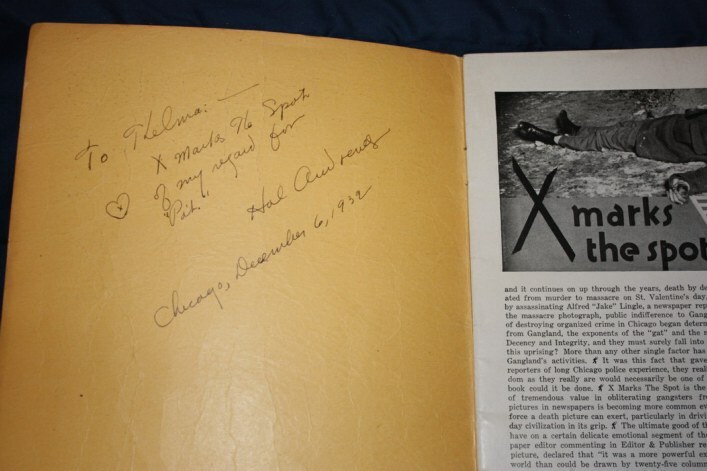 Once Madigan picked up a copy of X marks the spot and saw his name connected with Capone he got real pissed. This was stuff related to Andrews as a friend and not as a reporter. One day Hal Andrews had stepped in Madigan's tavern for a beer. Madigan confronted Andrews and told him of his extreme displeasure about seeing his name in the magazine. Madigan had once been a gangster, but by now was living a quiet life as a tavern owner. Andrews reassured his friend that he would correct it in future issues, of which he did. Madigan by that time, had rid himself of the Pony Inn tavern. 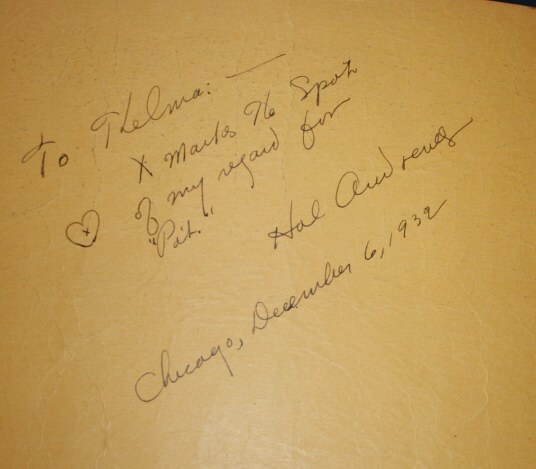 X Marks the spot magazine dedicated to Thelma by it's then anonymous author Hal Andrews. THE EFFECTS OF X MARKS THE SPOT. Hal Andrews kept his name confidential for fear of mob reprisals.This booklet made the gangsters look real bad to the public eye. The magazine got great circulation and it was stated that Al Capone gave the order to his minions to go around all the newspaper stands and remove the offending magazine. Hal wrote a piece for Real Detective magazine criticizing the way moralists from around the country had suppressed the sales of his book due to the gory content. A full page ad was published giving the public the possiblity of getting it through mail order. Hal's last job was as editor for the Gary Post Tribune. Hal Andrews passed away at the Veterans Hospital on March 14,1961, He was only 62 years old. Andrews had once stated that although he went incognito at the first printing of the magazine, he never left Chicago except for one business trip. Asked if he regretted ever publishing the magazine. He stated Yes, it had ruffled alot of feathers on both sides and had somewhat tarnished Chicago's image even more that what was intended. He wanted the magazine to help spur action in ridding Chicago of the gangster element. He felt it may have not worked the way he had wanted, but was sure about one thing,Chicago had big broad shoulders and would one day shrug it's bad reputation as a gangster city. Close up of Andrew's inscription. 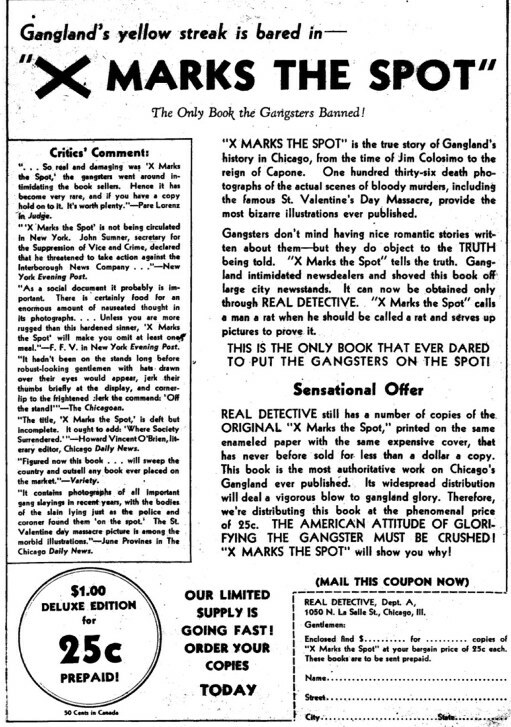 After Capone gangsters had X Marks the Spot removed from the newsstands, it was only available through this magazine offer in Real Detective. 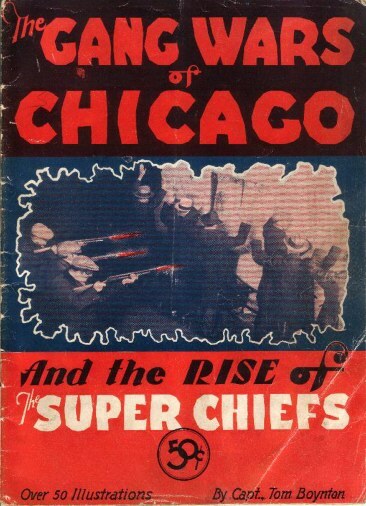 Subsequent copycats came along such as Al Capone in Pictures & the Chicago's Gang Wars, In the Morgue, The Gang Wars of Chicago and the rise of the Super Chiefs. 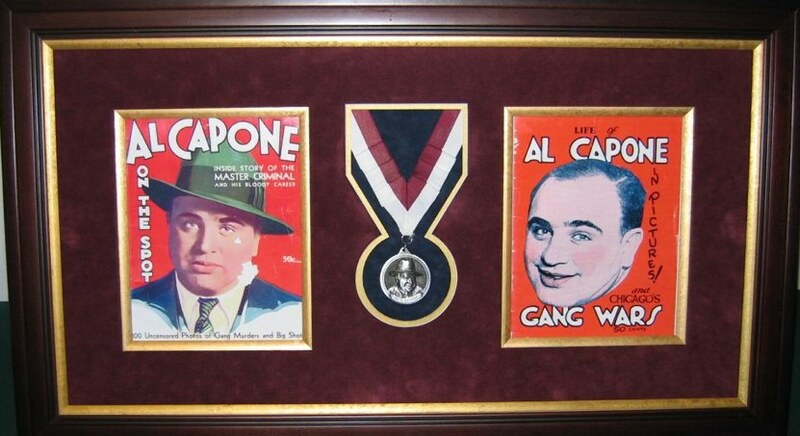 Left : Richard T. Enright's Al Capone one the spot Right : The Life of Al Capone in Pictures and Chicago's gang wars. 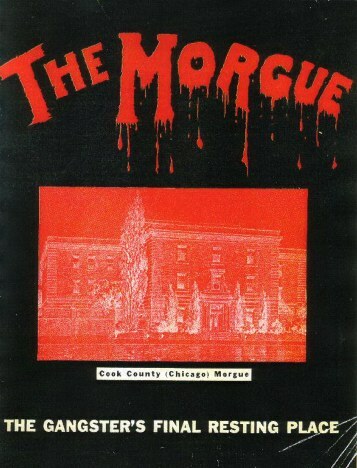 The Morgue; a very rare and gruesome magazine with many dead gangsters on the morgue slab. Many shots in this, some already seen with a few rareties. They were sold at different prices.They originally sold at a dollar and then they were lowered down to 50 cents. Originals are easy to detect. They have a raised feel to the cover and smell really musty with some slight rust to the staples. A real copy in good to fair condition is worth $75. A signed one by the author is of course considerably quite a bit more. The X Marks the Spot was reproduced identically decades later in the U.K. by Michael Dunkley. There was no recent printing date mentioned and by leaving in the original 1930 Spot publishing copyright tag, many people had been fooled in thinking these were 1930 originals. Some spent hundreds on a mag worth $10 dollars. 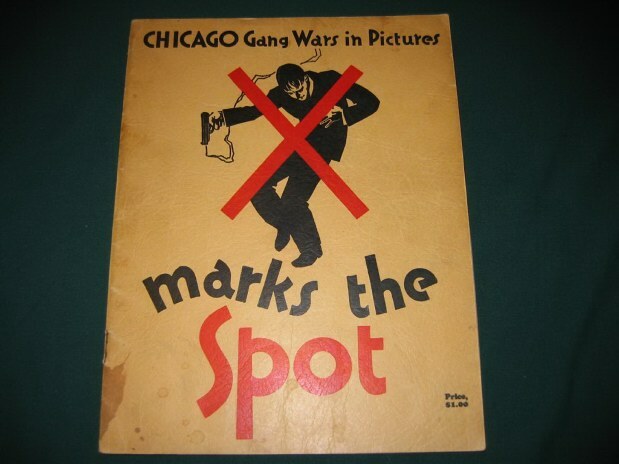 They were again reprinted under the title of Chicago Gang Wars by Dremon Press. Totally different quality and look. Blue printing on greyish white thick paper with Al Capone on the front holding a cigar. As far as copyrights to the magazine here is what the University Of Illinois came up with. Copyright status: Public domain. Published 1923-1963 with notice, but no evidence of copyright renewal found in Stanford Copyright Renewal Database.